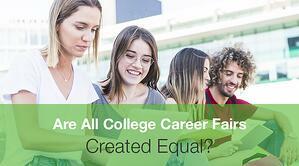 Are All College Career Fairs Created Equal? As you prepare for your first college career fair, you wonder what it’s going to be like. Will it be packed? Will students be able to find their ways around? And most importantly, will this be a good place for students to find jobs? Career fairs can be successful for students and recruiters - some more than others. As some seasoned career fair attendees may tell you, not all college career fairs are created equal. Students and recruiters often find fairs better or worse based on organization and how smoothly the whole event ran. Ranked on the strength of the university career center and the quality of the students, Looksharp has compiled a list of the best college career fairs in the country. What makes for a great college career fair? The success of a college career fair is based on a couple of factors: attendance and feedback. It is easy to tell how well a career fair was advertised and promoted by the number of students in attendance, as well as the number of recruiters. After the fair, students and employers will have formulated an opinion on how well the fair ran. This feedback from employers is important as it may determine whether they will be returning in the future. To plan a chart-topping college career fair, the planning, organization, and timing must all be right. Right out of the gate, a career fair organizer should be calculating a budget, searching for venues, and reaching out to employers. As these larger pieces come together, a more granular focus on booths, registration, and advertisement can begin. By getting ahead of these important aspects, a career fair is sure to be smooth sailing. One of the biggest complaints career services teams often hear is a lack of organization. The space was too crowded, the registration process was a nightmare, or employers weren’t assigned a booth. A well-organized event is key to good attendance and great feedback. Selecting the right time to put on a career fair is crucial, too. Not only should it be planned during the right time of year, but the month, day, and times are all important to ensure a well-attended fair. Research the best time to plan a career fair before getting started. If you work for career services, you know it can be a lot of pressure to plan a successful career fair. Depending on your university and the budget allocated, it may seem difficult to pull off a prosperous career fair. Learn more about how Career Fair Plus can put you ahead of the career fair planning game.